The UNESCO Libyan Valley Archaeological Survey carried out between 1979 and 1989 in Tripolitania (Northwest Libya) showed how the impressive long-term storage of water in the valleys (wadis) during antiquity made the region the Roman Empire’s breadbasket. 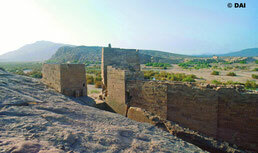 Another example are the aflaj in Oman, of which five were inscribed on the World Heritage list in 2006. The aflaj are a form of irrigation system typical for the regions from Morocco to western China. Other well-known names for the same system are qanats (Arabic) or karez (Farsi). All aflaj have at their main element channels without pumps, which distribute water over many kilometres. Due to the low gradient, water flows from underground springs, wadis or groundwater wells towards the farming fields, according to fixed quotas. The aflaj in Oman have a combined length of 1000 km and are up to 1,500 years old. Oases are places of ingenuity and efficiency. They are heavily competing trading venues - no „backwater“. In the middle of the desert of the Arab Peninsula along the Incense Route, the oasis came into being as a form of culture and economy over 6000 years ago. This was made possible by Neolithic well engineering technology. Gardens and fields were created, water rich oasis towns grew into political and economic power centres. The city of Marib in Yemen is a prime example: This largest oasis of southern Arabia was well known from Assyria to Rome. The German Archaeological Institute (DAI), together with hydrologists, investigates the early innovations enabling the rise of Marib. Among them is the “big dam” dating back to the second millennium BC. During the sixth century BC the dam was 680 m long, 18 m high, built out of earth, reinforced by stone constructions (sluices). Unlike barrages of today, it did not serve as a reservoir, but it fully closed off a wadi raising water to the level of the fields. By raising the water-level the semi-annual monsoon floods were channelled into a canal system that irrigated the oasis landscape of a 100 km² for 1000 years. Further oases systems in Morocco and Tunisia, for example, are designated as Globally Important Agricultural Heritage Systems (GIAHS) by the FAO. The programme preserves agricultural heritage and knowledge systems through dynamic conservation and promotes sustainable management and future resilience. The Upper Harz Water Regale is one of the largest pre-industrial power systems worldwide. It was built for the once-booming mining industry in the Harz mountains: Mining for silver, copper and other metals required large amounts of energy. Since it was also very lucrative, large investments in innovative technical power supply were made. „Regale“ refers to the underlying legal ordinance. Cistercian monks of the monastery Walkenried on the southern edge of the Harz mountains had constructed the first pond and ditch systems with water wheels in the early 13th century. Later, the system was extended to over 300 km of ditches and more than a hundred ponds. The ponds were arranged in a cascade such that the water could power many water wheels. There was also provision for periods of low rainfall. Today, the system continues to be operated because of its significance for the traditional man-made landscape. Some of the ponds serve for drinking water abstraction and flood protection. In 2010, the system was inscribed on the UNESCO World Heritage list as an extension of the Rammelsberg mine and the old town of Goslar.